If you’ve been looking for special gifts that make a statement, gifts that actually could change the world, you need to get yourself to the Holiday Peace and Social Justice Craft and Info Fair in Palo Alto this Sunday, Dec. 9. I will be at this awesome fair selling the Good Neighbor Stories 2013 Datebook. The fair is from 11 a.m. to 2:30 p.m., at the First Presbyterian Church of Palo Alto, 1140 Cowper St. It is co-sponsored by the Peninsula Peace and Justice Center and First Presbyterian. Last year I went to the fair to do a post for the website, and got to wander around checking out all the great products from all over the world, as well as meet a lot of volunteers—”good neighbors” all—passionate about the nonprofit organizations they were representing. There were lots of handmade items and artwork benefiting craftspeople in the countries of origin, fair trade coffees and other food items, recycled Christmas ornaments, and other great gifts. There were even rescued kittens in need of good homes, and rescued birds on display. A number of groups were on hand to educate shoppers about their charitable work, and maybe find new volunteers and donors. If you come, stop by the Reach and Teach booth, check out the datebook, and say “hi”. It’s December, which means it’s holiday time, when many people feel that tug to spread good cheer to others. We’ve got five ways you can indulge in the spirit of giving this month. If you’ve got additional ideas, please share in the comments! Jacob Goeders, a.k.a the Leukemia Slayer, in December 2011. 1. Give to a Holiday Drive:Some people love the tradition of giving at the holidays, others are looking for an end-of-year tax deduction. Whatever the reason, you can help a lot of people in need have a brighter season by contributing to a holiday drive, either with goods or cash. One of our favorite fundraisers, Jacob Goeders, a.k.a. The Leukemia Slayer, is raising money for the second year in a row for his Santa Slayer Project. This young man uses money donated to the project to buy gifts for other children on the Lucille Packard Children’s Hospital cancer ward, where he himself is being treated for leukemia. But you need to hurry, Jacob needs to finish up shopping soon. Other charities are collecting items like socks, bedding, or coats. Still others could really use gift cards to give to clients, or cash donations to buy what is most needed. Look for food donation barrels at stores and other locations to help local food banks combat hunger at the holidays. Or donate to the Good Neighbor Stories Virtual Food Drive for Second Harvest Food Bank of Santa Clara and San Mateo Counties. Our goal is to raise $1,500 by Jan. 1, 2013. 2. Give the Gift of Time: If you’re low on cash and items to share, consider volunteering your time this month. The United Way of Silicon Valley is looking for volunteers to help spread holiday cheer to the children of East San Jose. Every child at four schools will receive presents from their wish list, along with a book to encourage reading skills. Younger siblings will also receive gifts. Sign up for a shift today before all the spaces are filled. Find more volunteer opportunities at HandsOn Bay Area, and One Brick Silicon Valley. While the malls were bursting at the seams on a recent weekend, another shopping mall of sorts was bustling, as well. The items at this makeshift mall were just a little different than the ones for sale down the road. These items at the Peace and Social Justice Fair at First Presbyterian Church of Palo Alto on Dec. 11 aimed to make the world a better place. We started with how to be a good neighbor in your own neighborhood during the holidays, then talked about how to extend cheer to the community. Today is all about how to be a good neighbor to the world this holiday season. 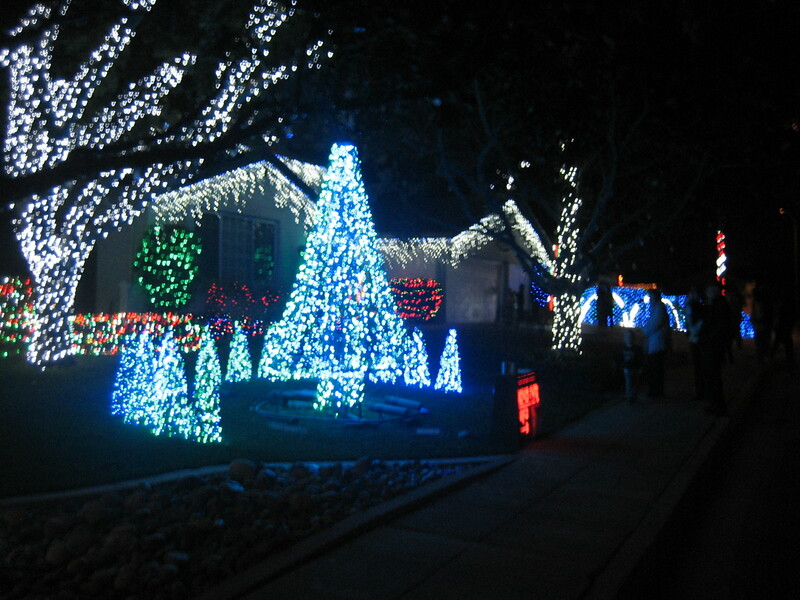 Use LED lights for light displays. According to physorg.com, LEDs last five times longer than regular lights and use 75 percent less energy (the link has several more great environmental holiday ideas). The Severns-Pease Christmas Display (www.severex.com) in Sunnyvale, CA., uses LED lights. Get creative about wrapping gifts. One friend of mine who wanted to reduce the amount of waste her family created during the holidays bought pretty fabric and sewed simple drawstring bags in various sizes to use for “wrapping” gifts. The bags are beautiful and will last for many years to come. Show your support for a soldier or veteran. A group called Soldiers’ Angels needs help delivering 190,000 care packages to deployed soldiers this holiday season and needs donations. The USO has it’s own care package program. Another great clearinghouse of information for how to help both soldiers and veterans here and abroad is salutetoservice.org. You may even find volunteer jobs right in your own community listed at the site. Give an alternative gift. For the person who has everything, you can donate to worthy causes in that person’s honor. You can visit the website of Alternative Gifts International to find an array of gifts that will help projects all over the world. Buy a cow or build a well for a village, or help education programs to build literacy. Or donate to nearly any cause you or the recipient believe in, and let that person know with a beautiful card. Sponsor a child abroad. For a monthly donation, you can help improve the life of a child in another part of the world. My family has participated with Children International for many years, and there are other wonderful groups that have similar programs such as World Vision and Compassion. Send a thank you to a former teacher, or greetings to friends far away you haven’t been in touch with for awhile. Let them know how much you appreciate them. Think Fair Trade when holiday shopping. Fair Trade is an entire movement that is trying to help communities lift themselves out of property by offering fair prices for products produced using fair labor practices in environmentally sustainable ways. Fair Trade coffee is probably best known, but you can also purchase chocolate, teas, spices, dried fruits, nuts, olive oil and wine. Fair Trade USA has an excellent website to learn more. Combine shopping errands to reduce fuel use. Plan out your shopping trips and try to come up with routes that use the least amount of gas (will probably help you save time, too!). Pray for peace. Take a few minutes out of each day this season to pray for peace not only in the world, but in your own community and even your own family. Just the act of praying will bring you a few moments of peace in your own life. Resolve to be a better neighbor to the world in the coming New Year. Make a new commitment to some act you haven’t tried before, like bringing reusable shopping bags to the store. Or think about conducting an energy audit for your home this year. What have you tried? Let us know about it! And if you try anything on this list, please let us know how it goes.